The 5th stage of the tour of Japan is unique in that it is just 11.4km long and has an average gradient of 9.97%. Its like no other stage in any road race because it starts at the base of Mt Fuji and ascends 1,137 meters to the 5th climbing station at 2,355 meters. The summit is another 1,421 meters higher but the 5th station is as far as the road goes. What a breathtaking ride! So strong is the desire to ride this route that 6,000 non professional cyclists shell out Y10,500 every June to compete in the annual Fuji Hill Climb event. Competition for places in this event is so fierce that entries sell out in less than an hour after going online. Its a shame not everyone can experience this spectacular ride. But wait ... Isn't it a public road to the 5th station? What's to stop a cyclist doing this ride anytime? Absolutely nothing at all. Barring bad weather, the road to the 5th station is open year round and cyclists do make the ascent (and thrilling descent) daily without going through the frustrating process of attempting to secure a place in the Fuji Hill Climb and without parting with the Y10,500 entry fee. While they don't enjoy closed roads, outside of the climbing season from July to October traffic isn't unbearable. Cycling to the 5th Station of Mt Fuji is one ride all cyclists in Japan should aspire to complete if not for the experience, then for the bragging rights. Not many sightseers get to view all 360 degrees of Mt Fuji. With an early morning start it is possible to circumnavigate the base of Mt Fuji by bicycle in a single day and view this spectacular mountain from every possible angle, not something that many people can boast. Cycling anti-clockwise from Fujiyoshida, roads to the West and South of Mt Fuji are surprisingly quiet, but this does take a turn for the worst on the North and North Eastern sides of the mountain. For those travelling with a less energetic party or those recovering from a hard climb or circumnavigation the previous day, cycling around Fuji's five lakes ( Lake Yamanaka, Lake Kawaguchi, Lake Sai, Lake Shoji and Lake Motosu ) is a relaxing recovery ride with few hills and spectacular scenery. 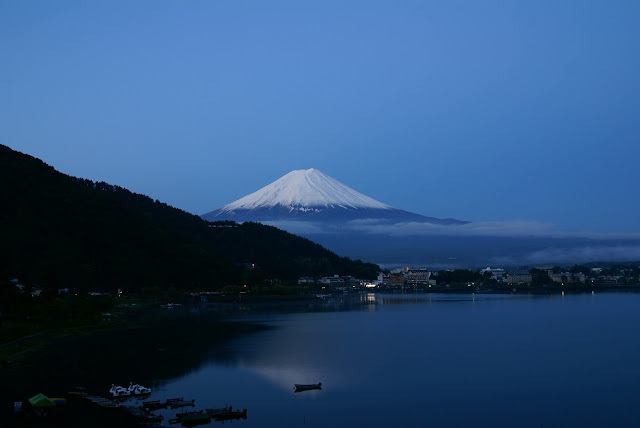 Mt Fuji can be reached by train from Tokyo by taking the JR Chuo line to Otsuki and changing to the Fujikyu line and traveling as far as Fujiyoshida station for a total cost of just 2,270 yen. The trip takes 1 hour 50 minutes and carrying bicycles on the train is free, but they will have to be bagged. For cyclists looking for more, the ride back from Mt Fuji into Tokyo is the perfect conclusion to a Mt Fuji cycling adventure. I did the 'Mt. Fuji Eco Cycling' last September. Well organized and would have been great views circling Fuji if the weather'd cooperated. What I disliked was the access by train to the start was a bother, making me stay over the night before in a Japanese hotspring town with nothing on at night, because there was no way I could make it in time for the morning start. This also doubles the cost of the event for me. As the original post stated, you could do the ride any day of the year, weather permitting. Just work out the route with ridewithgps, catch an early train from you town, put the rinkobukuro in a locker at the station and RIDE. No problem, sahib! I'd like to go there by cycling in the end of November. Is it OK to ride the Fuji Subaru Line during that season?